We deliberately planned our first full day in Japan to have just one park, giving us relatively simple transport requirements. We thus took the Tsubame Limited Express train from Hakata to Ōmuta, where we sought out a bus to Greenland. Locating the correct stop proved tricky, as all the signage was in Kanji, but a print out of the park web page meant that we knew which set of pretty pictures was correct. Our choice was validated by the large group of children and teenagers chattering excitedly nearby. Though they did form an orderly queue, the number of people involved meant that it was every man for himself when the bus eventually arrived. George got a seat; I was not so lucky. 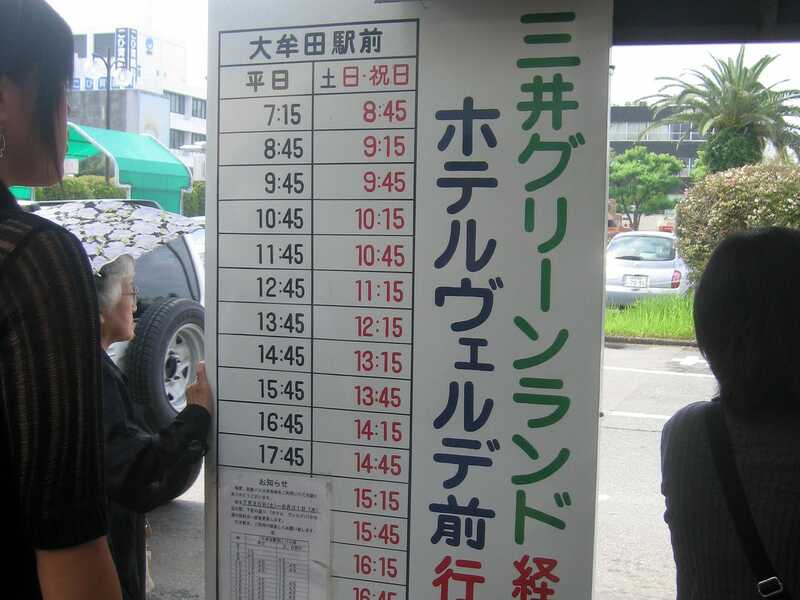 The Japanese have a wonderful system for paying bus journey fares. Passengers take a numbered ticket on boarding that shows which stop they got in at. They can then see the current fare for their ticket from a display screen at the front of the vehicle, similar to what you might see in a taxi, though with individual numbered fares for the different tickets. When the time comes to disembark, it is simply a matter of placing your ticket and the right amount of change into the machine beside the driver. Those without correct change are catered for by a conveniently accessible change machine. It's a shame that bus systems worldwide don't work the same way. On arrival at Greenland we were immediately recognised as foreigners. Our height would have been a dead giveaway even without our caucasian appearance; we were the only people over 5'4" in sight anywhere. This proved to be a blessing; the helpful cashier was ready with English versions of the park map and a laminated card with all the available ticket prices in a language we could actually read. The unlimited ride wristbands set us back the princely sum of ¥4700 apiece. Gao (#551) seemed like the best choice for my first Japanese credit given that it is currently the ninth longest coaster in the world. The entrance was through an oversized dinosaur head which led to a set of steps directly into the station, a definite suggestion that the park never gets particularly long queues. The train was waiting as we approached, and we quickly made a beeline for front car. Within seconds it became clear that we wouldn't be able to share a row; in fact, the only way we could fit in the train at all was to sit sideways across two seats, the legroom having been designed around the average Japanese height. The ride felt very much like the Pepsi Max Big One; it had a decent enough first drop and plenty of track, but the layout didn't do all that much. The tracking was fairly smooth however, corners notwithstanding, resulting in an enjoyable ride. Our next ride was a chair lift featuring single seat cars with no restraints whatsoever, relying heavily on the behaviour of those riding. There was some webbing underneath to catch anyone who might fall out; I found myself wondering whether anyone had landed in it over the years. Given the behaviour and general efficiency witnessed in this country thus far it wouldn't surprise me at all if the answer was no. The routing took us over a pedal-powered railway and came out underneath the lift hill of Atomic Coaster (#552), my first encounter with a Meisho-built shuttle loop. This ride replaces the typical launch with the slowest chain lift mechanism in the known universe, which takes a full two minutes to raise the train to the top. From there gravity takes over; riders are dropped backwards through the station and into a loop before reversing their journey. The ride was okay if not overly memorable; I much prefer the Schwarzkopf models. There was a bizarre loading procedure in use on Spin Mouse (#553) that rendered the use of seven cars utterly pointless. The operators would load all of the cars at once, ensuring four people in each. At that point they would place a barrier at the end of the station and dispatch all the cars at the minimum interval for the ride, as might be seen on a fairground in Germany. However, they would then wait for all seven to return to the station before starting the process afresh. This hurt throughput significantly, though to be fair the wait time was still negligible. We enjoyed some intense spinning on our lap, though it still wasn't quite to the level of the unit at Brighton Pier. Our next stop was at an attraction described on our map as The Shrine of Satan's Forest, though the building sign (in English) said Adventure Ride. The elaborate carvings on the outside suggested something Egyptian, but in reality we found a fairground-style motion base simulator showing the Garaxy Grand Prix video (not my typo), a fairly generic affair involving a high speed chase through a variety of different rendered worlds. The video projector appeared to be in need of replacement; the entire display was out of focus and the lower half had a distinct sag to it, perhaps explaining why there was no queue. From a distance the Dragon River rapids looked no different to what one might find in a western park. However, as we approached it became apparent that each moulded plastic seat had been given a brightly coloured cushion. This might explain why the staff were insisting that every boat was filled to capacity; human backsides would ensure that these didn't get too wet. In reality the layout was sufficiently tame that sponges would have remained almost completely dry; the only really interesting section of the ride was the loading station, which was built inside a heavily themed artificial mountain. Our next stop was at Sphinx (#554), a terrain family coaster with a height differential of no more than fifty feet. At the apex there was a short tunnel filled with flashing lights that represented the sole moment of interest in an otherwise dull ride; from that point forth the layout consisted of four long straight sections separated by turnarounds, each roughly two hundred feet in length. The only thing to be said for the layout was that it used almost all of its potential energy budget; the train can't have been doing more than ten miles per hour when it hit the final brakes. 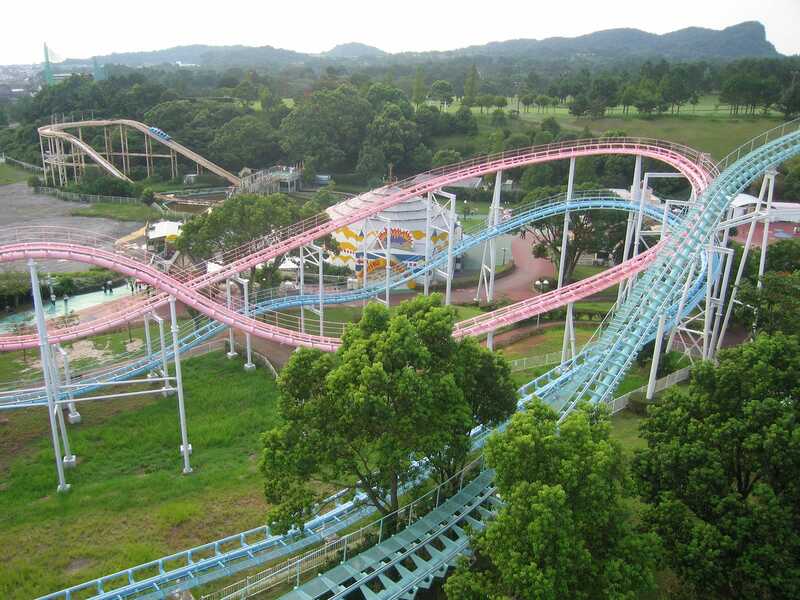 We were not expecting a great deal from Fujin-Raijin (#555), a racing coaster from Togo. The pink sit-down track was a little problematic due to the now expected lack of leg room, but the aquamarine stand-up track was remarkably good, being smooth from start to end. It was certainly a better effort than Grampus Jet (#556), an elderly Vekoma suspended coaster operating with Arrow trains. As regulars will know, coasters that swing are among my favourite out there, but I found it impossible to enjoy this one as the cars shuddered badly on their way around the track. The only sit down coaster of the day that we had no difficulty fitting in was the powered Ladybird, a twin helix non-credit aimed firmly at small children. My immediate thought was that the hardware might have been supplied by a western company, but the train wasn't like any I'd come across in my travels, and there was a distinctive kink between the two helices which would not have passed quality control in the Zamperla factory. As of this writing RCDB has no information on the ride's provenance at all; if you can shed any light, please do get in touch. At this stage we'd finished off all of the coasters that we expected to enjoy, and thus we headed to the end of the park with the two remaining ticks on the grounds that we'd need to get them over with sooner or later. We had hoped against hope that the fine engineering talent visible everywhere in Japan might have been put to some use on Nio (#557), a standard layout Vekoma SLC. Sadly, this proved not to be the case; this model was just as rough as every other installation I've been on. Worse yet, the restraints had been modified to provide a little extra vertical padding for the shoulders, meaning that taller people fit even less well than usual. I can now proudly claim to have ridden SLCs in nine countries, which is a little silly given that I have yet to enjoy one. With that done we slowly climbed the stairs up to Megaton (#558), one of just a handful of Togo Ultratwisters worldwide. Our only previous encounter with the genre at Six Flags Astroworld was fresh in our minds as we pulled down the heavy restraints. As things turned out however we need not have worried; this installation was running quite well, and for the most part was a decent enough ride. The only negative points were the brake segments at each end of the track, which felt very much like colliding with a brick wall. If anyone from the park is reading this, please consider upgrading this system with shock absorbers; it'd make a huge difference. 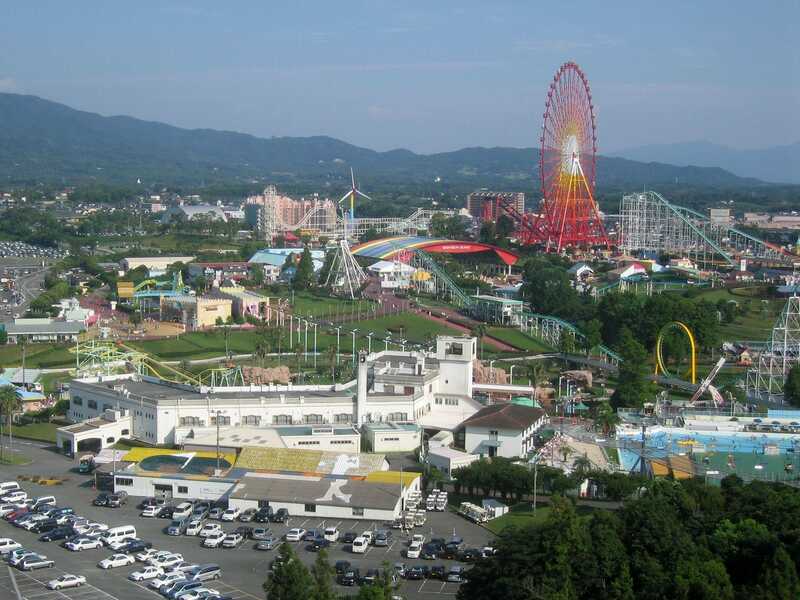 The park has an enormous Ferris Wheel with forty-eight cars that stretches at least one hundred metres into the sky. Eight of them have air conditioning packs installed, and we decided that it was worth waiting in the slower-moving queue for one of those. This was definitely the right decision, as it gave us ten minutes out of the oppressive heat. We realised subsequently that none of the cars had windows, meaning that a ride in tn the regular ones must have been like sitting in a sauna. We took a second ride on Gao before stopping for lunch. This was something I had been a little concerned about; though Japanese cuisine is one of my personal favourites, I did not relish the idea of trying to negotiate a menu in Kanji. Fortunately I need not have worried; the menus consisted entirely of pictures of the various options, so it was simply a case of pointing at the required choice. A certain amount of luck was still required; I thought I was ordering chicken but ended up with what I think was fish of some kind, but whatever it was tasted fine. The entree also came with a portion of delicious Miso soup. The only real challenge presented by the meal was the necessity of consuming everything with chopsticks. My complete ineptitude at this was noted by the table staff, one of whom took pity on me and brought me over a fork. Most of the people around found this frightfully amusing; I was just grateful. We had spotted an Alpine Slide on the way to lunch, and determined that a second Chair Lift would be required to get to the top of the mountain where it originated. Once again this did not have any restraints at all, opting instead for netting underneath the course. This ride left us beside the Horror House, although the name in this case is of dubious merit. 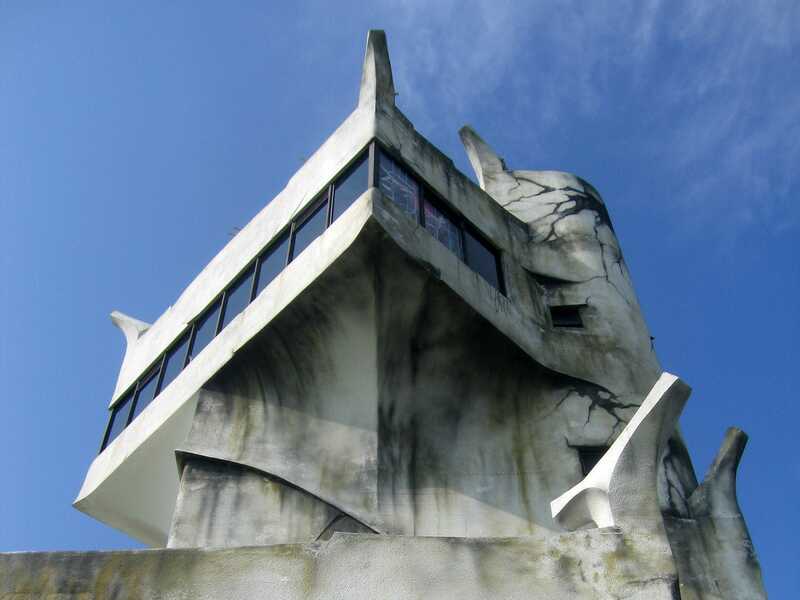 The building was certainly interesting from an architectural point of view, but the contents could not be described as frightening even if one was being particularly generous. We were not able to abort part way through and had to walk all the way to the top through assorted scenes before taking a lift back to the base. 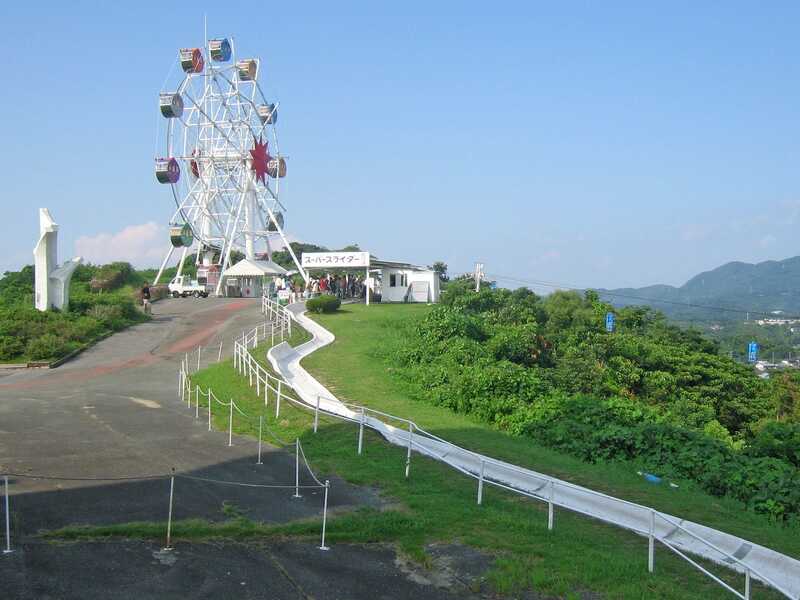 Also at the top of the mountain was a miniature Ferris Wheel with automobiles on it in place of the more traditional ferris wheel cars. The theming, if you can call it that, was labels on each car signifying different signs of the zodiac. Having seen this it was not surprising to discover that the ride was named Horoscope. It got me thinking about the job of telling peoples fortunes, and the whole idea of predicting the future. The ideal solution remains a DeLorean fitted with Flux Capacitor, but let us assume that this is not available. I am going to make a bold prediction for all the residents of Japan for August 29th. Tomorrow you are going to sweat like pigs in weather of at least 27° celsius, with humidity of not less than 70%. You saw it here first, folks. At any rate, we finally made our way over to the Alpine Slide, which featured Ansaku-branded sleds in a stone trough. The queue for this moved at the same painfully slow rate of every other such attraction around the world thanks to the inherently low capacity of one rider every thirty seconds at best. On reaching the front, we were presented with a laminated card showing an English translation of the ride rules, in somewhat broken language but comprehensible nevertheless. Moments later, I released my brakes and started moving. It quickly became apparent that this was not a slide that could be taken at full pelt. I came precious close to going over the side at the first proper turn, and from that point onward I violated coaster enthusiast code by gently applying the brake. The locals were even more cautious than I was; despite a thirty second delay before my dispatch I still managed to catch them up about two thirds of the way down the course, and in all honesty I am not surprised; I was probably going too close to the limit for safety. A ride as aggressive as this one could never get insurance cover anywhere else in the world as badly behaved riders would hurt themselves. It was tempting to go back for a second lap but we decided that it would take too long; instead, we finished out our day with a ride on the Parachute Drop ride for overhead photography. The return trip to our hotel was even easier than the outbound trip, with a bus to Ōmuta followed by the Ariake Limited Express train back to Hakata. While waiting on the train platform I noticed something positively startling based on my experience at home; all the trains were dispatching at the exact time in the timetable, down to the second. This precision is something that should be possible everywhere in the world, but requires serious investment, something that the Irish government seems unwilling to do. I'd love to say that will change some day, but that would probably constitute optimism to the point of foolishness.